Here is a new Reality Check Video for you. This is Reality Check Video #60, the fourth Reality Check Video of 2019. In this one you will see an armed robbery, but you won’t believe the stupidity of the robber. Watch this video and then take me up on my offer to train you free of charge, with no strings attached! Our 25 new ranges are now completed! I want to fill them with responsible citizens. So I am giving you a $2,000 Four Day Defensive Handgun Course absolutely free of charge, with no hidden surprises, catches or obligations that you can use at any time in the future with no expiration date or transfer to anyone who has not yet attended a course at Front Sight. And what’s even better, is that I will also give you even more amazing benefits and bonuses including placing $100 in the Front Sight account you establish when you secure your free handgun course and give you the opportunity to get free guns… LOTS of free guns. It all starts with showing me you are a patriotic citizen who wants to be a walking, talking representative of safe, responsible, proficient and expertly-trained gun ownership, by grabbing your free course! And remember, once you secure your course to use at any time in the future, I can give you even more amazing benefits and bonuses, including placing $100 in the Front Sight account you establish when you secure your free handgun course and give you the opportunity to get free guns… LOTS of free guns. There is a reason why my hundreds of thousands of students and members call me the Millionaire Patriot. It’s time for you to find out why too! 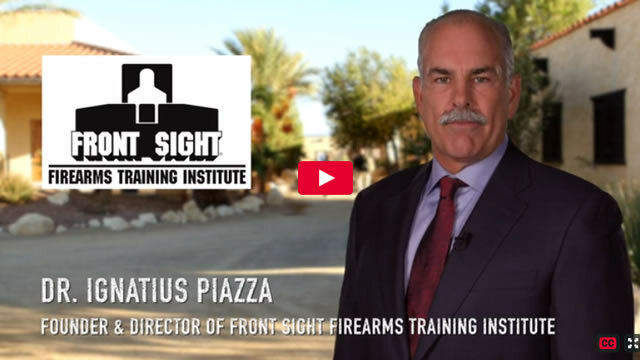 Entry Filed under: Dr. Ignatius Piazza,Front Sight,Front Sight Reality Check Videos,Gun Training,Monday Blog Posts,Newsletter,Self Defense.